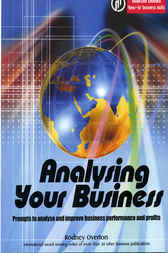 This book is intended to offer a range of prompts for a number of wide and diverse business areas which can be easily measured and analysed by business managers in a short time frame and thus offer an analysis and diagnosis of business performance and which can be used to improve both performance and profits. Many people fail to understand that the main reason for running a business is to make a profit - in fact many people seem to feel guilty about having to make a profit! In this book we offer ideas and suggestions for analysis under four major headings and business areas - Management and Planning, Human Resources, Sales & Marketing and the Control Process. Many managers of course claim that they are just too busy to measure, analyse and diagnose the performance of their business apart from basic sales figures. And it is not unusual for many businesses to produce their taxation results around nine months after the close of the year: figures which are far too old to have much use as an analytical measure. In our recent experience the Managing Director of a loss making, medium sized organisation was asked what he measured in the organisation and how it was measured. He was most embarrassed and unable to answer but a few weeks later he surreptitiously arranged some training for his staff to enable them to set up measurement, performance, analytic and diagnostic standards. Conversely, people who work for multi-nationals for the first time are invariably amazed at the number of areas and items that local subsidiaries are required to measure and report on a regular basis for analysis and diagnosis by their distant head office. In this book we have endeavoured to provide a diverse range of thought provoking and stimulating information and checklists which can be used to analyse and improve the performance and profits of your business. We currently have a range of more than 100 books, CD ROMs and Training Facilitators Manuals available, covering areas of business such as Business Administration, Business Planning, Finance, Human Resources, Management, Marketing, Sales and Small Business. We hope that the material presented will offer encouragement, suggestions and resources to support new and effective ways of leading and succeeding in your chosen field. And remember - a new objectivity can be wonderful thing! Your feedback is welcome.